It is advisable to have your own travel solar charger you can always bring on a camping or trekking trip. Not all paths can be traveled by car where you can charge your smartphones or cameras anytime. But with a portable solar charger, charging your gadgets will be a breeze even while you are just walking. Consider this checklist first before you purchase your solar charger. Size: As a backpacker, additional weight to your bag can slow you down especially if you are the minimalist adventurer type. Solar chargers have different sizes so you can choose what is best for you. Price: It varies depending on the material and efficiency in charging your gadgets. Always look at every brand as they sometimes offer the same specifications but different prices. 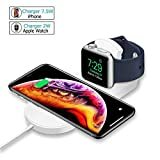 You can buy the cheapest one with the same charging power as the expensive brand. Material: There are solar chargers that are built to withstand rain and accidental falls. If you are an adrenaline junkie and extreme weather do not stop you from your adventure, choose a solar charger that is waterproof and dustproof to keep up with you. Compatibility: Some solar chargers are more effective for Android phones than Apple products. Or you might have a DSLR with you that you also want to charge while on your trip. Check the compatibility of a solar charger to your gadgets so you can make the most out of it. Technology: Of course, the most up to date solar chargers are equipped with the latest technology to make charging faster and more efficient. A good travel solar charger does not only give one full charge to your smartphone but has a high mAh to fully charge not only your smartphone but your other gadgets as well. If you are looking for a long battery life of a solar charger, this product might be the one you are looking for. 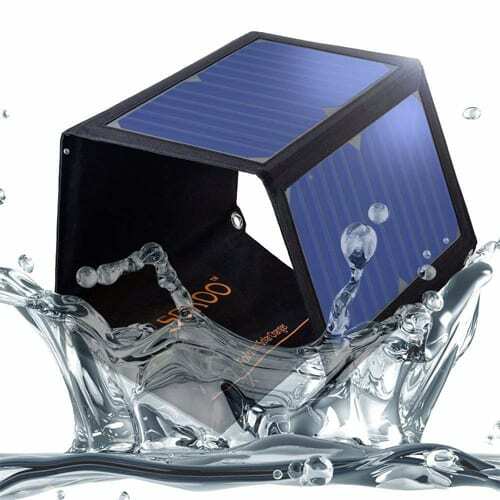 This solar-powered charger looks solid and tough in every kind of weather. It has also a design that you can use in the metro without feeling embarrassed that you are bringing a generator with you. It has a 25000 mAh capacity. This solar charger has 3 outputs. You can easily full charge not only your phone but also your tablet. It is equipped with LED lights perfect for camping. It can be charged via direct sunlight or power outlet. It takes a week for a full charge if you will only recharge it via sunlight. Some say the solar charger does not hold a full charge. 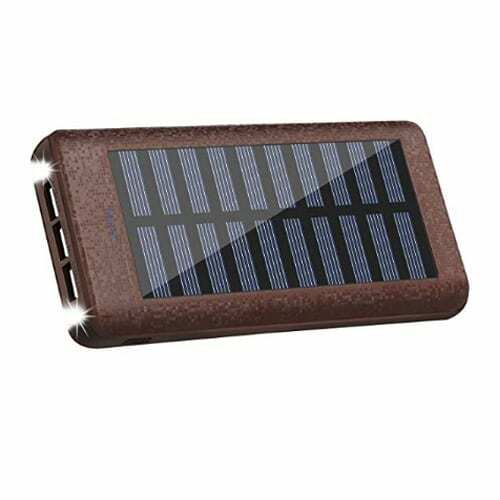 If you are living in the tropics or are the sun is out in your area all year round, this might be the best portable solar charger 2019 for you. It can be easily recharged by the sun thus you can lower your electric consumption. But even if you are experiencing 4 seasons in your country, this is still a great powerbank and emergency charger. Do you love hiking and are searching for a solar charger that you can easily carry outside your bag? Look no further as this can be the best solar charger for backpacking that you need. This solar charger can be easily clipped to your bag using a carabiner and it will be getting charged while you are on your hike. 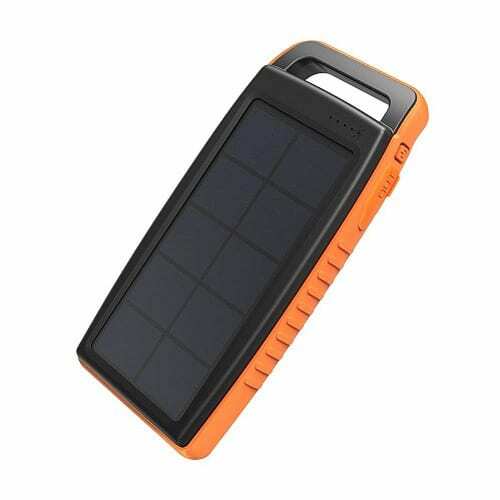 You can easily see this solar charger even in low light with its orange outline. It is equipped with dual DC 5V/2A so you can recharge it on a power outlet. This has a battery capacity of 15000 mAh. It is shockproof, waterproof, and dustproof. You can easily hang it from your backpack. it can easily give a full charge to up to 3 phones. This can be charged indoors via wall charging. It has a smaller mAh compared to other solar chargers. Some may find this bulky. If you are more likely searching for a power bank, this is good for you. Unless you will be traveling and hiking in the desert for days, the solar charging will become handy. You will not have to worry improvising straps to hang it as you can easily use a buckle to hang it from your bag. 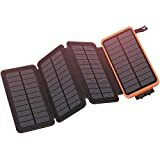 Have you seen a solar charger that does not act as a power bank? Are you planning to get one for the sole purpose of bringing it on your camping trip? This might be the best portable solar panels for camping. Read on to learn more about this product. This solar charger does not look like your typical solar charger slash power bank. 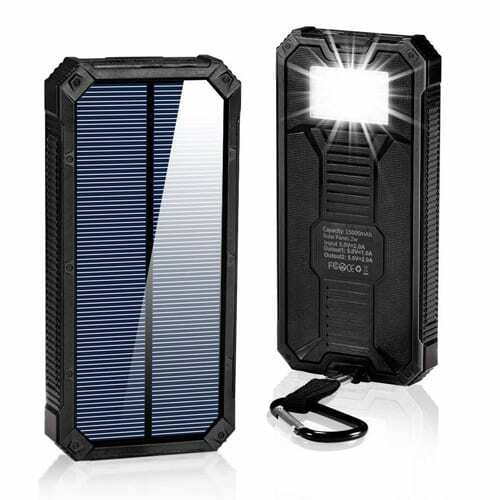 It is more likely a portable solar panel that you can easily bring and use on a trek or camp. This solar panel is known for its durability and resistance to any weather condition. It is lightweight and portable you can easily fold it when not used. This includes an 18-month warranty. The wide solar panels are very efficient in converting solar energy to charge your gadgets. The eye-holes on the solar panels can easily be attached and hung from your bag. No need to keep it when you experience a thunderstorm while hiking. You cannot use it when there is no sunlight. The absence of a battery pack makes it impossible to use it at night time. This could be the best travel solar charger especially when you are planning for a week camp-out during summer. You can make the most out of it as the sun will be always present on summer days thus charging your gadgets will be possible. You can charge your phone or camera during the daytime so you can take videos and photos of your trip. Some survivalists or outdoor enthusiasts own their own survival bag to make them feel prepared when sudden circumstances happen. Having a solar charger included in the kit is recommended as it can power up your gadgets when necessary. 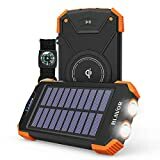 Not only this solar charger will charge your phones and other gadgets, but you can use this as a great light source with its equipped flashlight. Though it does not claim to be shockproof, this looks like a tough solar charger. It has 3 power output ports. It has a 24000 mAh battery capacity. This is portable and can be kept in your bag’s pocket. The 3 output ports make it possible to charge 3 gadgets all at the same time. The price is a steal for its effectivity. It does not support some phone models. A fall might easily damage the solar charger. This is an okay solar charger, it does what it says but you should be more careful in handling it as it is not as tough as it looks. 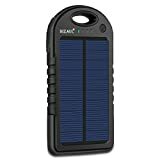 Overall, this is still good as this is part of the best solar phone charger 2019 list. Some solar chargers claim that they have a high battery capacity but once when put it to the test, they cannot fully charge a phone. This only has 8000 mAh but is this reliable? This might have the lowest battery capacity on the list but it looks tough and can fully charge a mobile phone easily. The 8000 mAh may be enough for emergency situations wherein you would require an extra charge. It can be charged via sunlight or via USB cable. This has 3 output ports. It includes a hook to hang it easily from your backpack. It is equipped with 21 LED lights, great for night activities. You can simultaneously charge 3 gadgets. It is good for emergency use. Some say the solar charging is not effective. 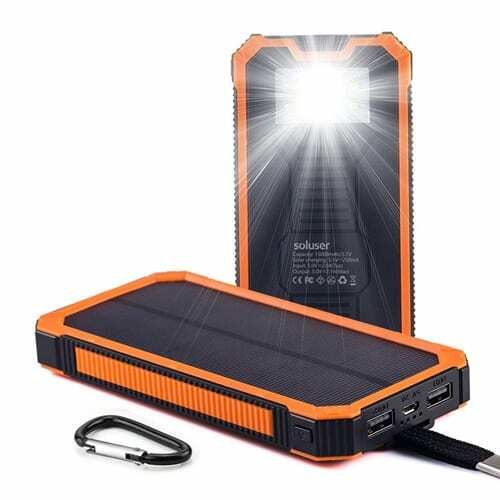 If you are just looking for a spare power bank or solar charger, this might be a good choice. With its 21 LED lights, this is really a great source of light in camp trips. Any outdoor enthusiast would want a solar charger that they can use and be tough in any kinds of weather and terrain. Will this solar charger will be their first choice? This solar charger looks rugged and can withstand any falls without damaging the unit. The rubber cover of this solar charger makes it more waterproof and shockproof. It is equipped with Sunpower Solar Cell panel, making the power conversion more effective by 21-24%. The Li-polymer battery installed in it is the world’s safest battery. No fear of explosion due to the Li-polymer battery. The design lets you hang it easily from your backpack. It is equipped with LED flashlight and indicators. Some claims it does not function well. It can only give 2 full charges to an iPhone 7+. This might be the cheapest solar charger in our best solar phone charger 2019 list. This is effective and reliable if you receive one from a good batch. Otherwise, some received defectives that you can always ask for an exchange or refund. Everyone loves a light solar charger that they can always bring with them and make them feel it is a drag to have it with them. A good, portable, solar charger must be carried with ease. This solar charger looks thinner compared to its competitors. This has a design wherein there is a hole in the corner of the item. This is actually great as it makes it easy to just clip on your bag. Each micro USB port is covered with a rubber cap. It can recharge 2 devices at the same time. This is equipped with LED lights. The USB ports are safe from water splash. It has a maximum output of 5V. Some experienced not getting a full recharge. A few say that the rubber caps do not fit perfectly. Overall, this is a great product. For the price, it sure is very affordable. It is advisable to get 2 of this if you have more than 2 gadgets you will bring on your trip. A good camping solar charger should be waterproof, shockproof, and dustproof to maintain its effectivity for the whole trip. 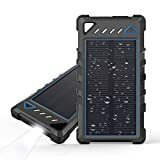 Do you think this is the best portable solar charger this 2019? The design of this solar charger is perfect for a traveler. It looks tough, it is handy, and looks like it can do its job well. It somehow looks like a smartphone with the placing of the LED flashlight. This has a 15000 mAh capacity. It is equipped with 2 fast-charging power output ports. This has 2 LED flashlights and 4 LED indicators. It is made solid to protect it from rain, dust, and wear. The kit includes a micro USB cable, carabiner, user’s manual, and 18 months warranty. You can also charge it with electricity. Some received a defective solar charger which can be replaced but still a hassle. It does not have the battery capacity as it claimed. This solar charger is a good option as an emergency and additional power source during long days in the woods. If you will ever receive a defective unit, the company will be happy to assist you and offer you a replacement. Do you find it difficult to look for a solar charger where it can effectively charge your DSLRs? Yes, you can actually charge not only your smartphones or tablets via solar charger but your DSLRs as well. Though the size can be as big as your backpack, when this solar charger is folded it will only take a little space in your bag. It does not have any internal batteries so charging your gadgets will rely upon the power of sunlight. It is equipped with Wildtek SmartCharge Technology to effectively give a 100% charge to your gadgets. The design is lightweight and portable and can be easily hooked onto your bag. Wildteke offers a 2-year warranty for this product. You can fast charge your gadgets with its SmartCharge Technology. It is not limited to charge smartphones and tablets, but also DSLRs. Most of the users claim it is still effective whatever the season may be. Some claim it does not charge an iPad. It is too expensive for a solar charger. Some gadgets might not compatible with this solar charger, but many say that it does wondersl in their DSLRs. So if you are an avid photographer or vlogger, this must be on your to-bring list on your next journey. Planning on a week in the woods? It is best to have a solar charger with you so can still contact your family and friends on your activities. This portable solar panel looks like it is ready to be used wherever you will go. It looks durable and can withstand any weather condition but still can be effective to charge your gadgets. This has 2 built-in USB ports. This solar charger has a 1-year warranty. This is very effective in charging gadgets when the sun is out. It can charge a power bank. It can be easily clipped on your backpack. Its weight of 1 lb might be heavy for some. Some phone models are not supported by this solar charger. If an additional pound on your hiking bag does not bother you, then this solar charger is the one you are looking for. You can easily hang it outside your cabin or tent so you can still use your gadgets when you need to. It is eco-friendly. You get the energy you need to charge your gadgets directly from the sun thus you are saving the environment in a little way. Too much use of electricity at home requires great power from sources that are most of the time uses technology that is harmful to nature. By using solar chargers and solar panels at your home reduces the harm we give off to our environment. It is cheaper in the long run. Yes, most effective solar chargers might be too expensive but you will notice that if you will use it more often than your regular chargers, your electric bill will get lower in the coming months. A great addition to your survival bag. Many are interested in having a survival kit or bag at their homes and cars. This serves as a preparation and peace of mind to people when an inevitable event will occur. By having a solar charger in your survival bag, you will get to recharge your gadgets when electricity is not available. They are portable. Most solar chargers are made small and compact so people can easily bring them everywhere. As we are living in a fast-paced world, most of the time people tend to forget to charge their phones or cameras before going to work or a trip and that can be really a bummer. When you have a solar charger that you have left to charge under the sun the day or weeks before, you can bring it with you and charge your gadgets while driving or on a commute. Solar chargers are recommended not only for people who love the outdoors but to people who are always-on-the-go too. It is also very eco-friendly and by using one solar charger of our choice, we are helping in saving Mother Nature by decreasing the usage of electrical energy. By using solar chargers, you are not emitting harmful substances like carbon dioxide and monoxide in the atmosphere like the power plants where the electricity usually consumed comes from. If you are planning a vacation in the near future, you now have an idea what is the best portable solar panels for camping.